Been to any Christian festival this year and you may well have seen the above offending item. In fact I first saw said item when two young women from another youth group stepped up to pray for me just last week. As a youth worker I was encouraged that they got off their butts to pray for a random stranger, it takes guts and balls to do that but the shirts they were wearing made me sigh. Sigh because the world offers us sexualised slogan t shirts at every turn and I want desperately for the young people around me to live in the world and not of it. I am hungry to see young people embracing the secular and highlighting the sacred to their peers but I feel like this just doesn't do that! 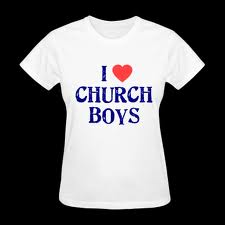 But it could ... what if Christian men wore T shirts that said I <3 Church Boys, if women wore shirts that said I <3 Church girls & we all wore t shirts that said I <3 Church gays. now that would turn heads, that would highlight the sacred in the secular realms of slogan T shirts, that would make my spirit jump!